If you have any questions about the ANNAEVA information page below please contact us. 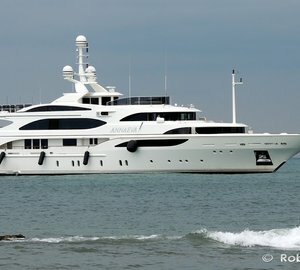 ANNAEVA used to be named project/yacht name (Benetti Fb) Lady Sheila. This 56 m (183 foot) luxury yacht was produced by Benetti Yachts in 2007. Motor Yacht ANNAEVA is a impressive superyacht. The firm of naval architecture whom authored the design work for this ship is Benetti and Stefano Natucci. This boat's interior design work is by Zuretti Interior Design. Luxury yacht ANNAEVA is a quality yacht that is able to sleep as many as 12 people on board and has a total of 14 professional crew. Motor yacht ANNAEVA is a close sister to Benetti’s ALTITUDE (FB 228), GALAXY (FB 232), ALLEGRO (FB 225) and SUNDAY (FB 235). Benetti was the naval architect firm involved in the professional nautical plans for ANNAEVA. 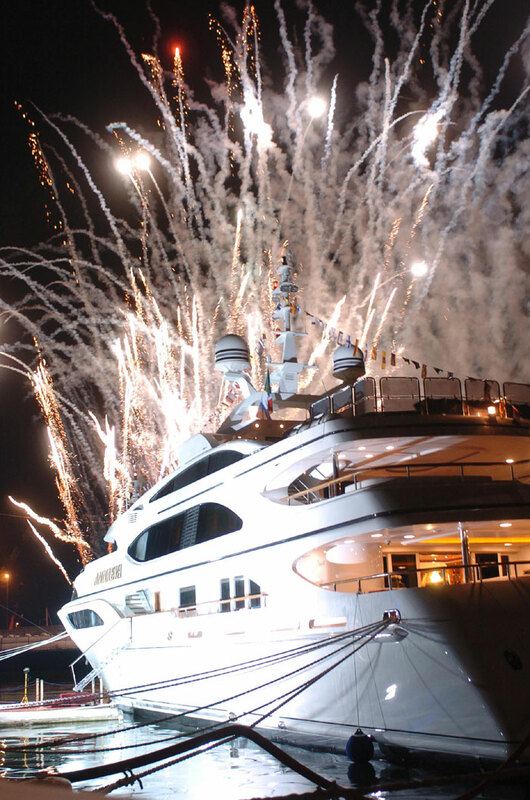 Also the company Benetti and Stefano Natucci successfully collaborated on this venture. Interior designer Zuretti Interior Design was selected for the creative interior styling. In 2007 she was actually launched to accolade in Livorno and post sea trials and finishing touches was afterwards delivered to the yacht owner. Benetti Yachts completed their new build motor yacht in Italy. The hull was constructed with steel. The motor yacht superstructure is fabricated largely from aluminium. With a beam of 10.4 metres / 34.1 ft ANNAEVA has fairly large size. A reasonably deep draught of 3.2m (10.5ft) selects the amount of worldwide marinas she can visit, contingent on their particular depth at low tide. The 3512 DITA engine powering the yacht is produced by CATERPILLAR. Connected to her Caterpillar engine(s) are twin screw propellers (benetti). The engine of the ship generates 1850 horse power (or 1380 kilowatts). She is fitted with 2 engines. The combined power for the boat is 3700 HP or 2760 KW. Offering room for a limit of 12 visiting passengers staying on board, the ANNAEVA accommodates everyone comfortably. This ship carries approx 14 capable crewmembers to operate. 56 metres / 183 feet. Sari-Solenzara. France. Département de la Corse-du-Sud. Corsica. In Sept 2009 ANNAEVA sailed to Sari-Solenzara, in France. ANNAEVA has cruised the cruising ground around Département de la Corse-du-Sud during the month of Sept 2009. She has a teak deck. The luxury yacht ANNAEVA displayed on this page is merely informational and she is not necessarily available for yacht charter or for sale, nor is she represented or marketed in anyway by CharterWorld. This web page and the superyacht information contained herein is not contractual. All yacht specifications and informations are displayed in good faith but CharterWorld does not warrant or assume any legal liability or responsibility for the current accuracy, completeness, validity, or usefulness of any superyacht information and/or images displayed. All boat information is subject to change without prior notice and may not be current.